White Innocence and the Savaging of Post-Colonial Subjects. A lecture by Houria Bouteldja. 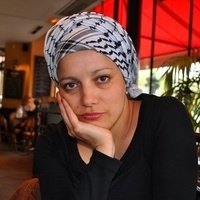 Houria Bouteldja is a founding member of le Parti des Indigènes de la république, decolonial political member based in France. She has written numerous theoretical or strategical articles on decolonial feminism, racism, autonomy, and political alliances as well as articles on zionism and state philosemitism. She is the author with Sadri Khiari of "Nous sommes les indigènes de la république" (Editions Amsterdam) and "Whites, Jews, and Us, Toward a Politics of Revolutionary Love" (Semiotext(e)). Co-sponsored by Columbia University's Department of Religion, and Department of Middle Eastern, South Asian, and African Stuides.